The Gemini Ring is a clever twist on the Jardine Ellis Ring and anything that can be done with an Ellis Ring can be performed with the Gemini Ring plus more. 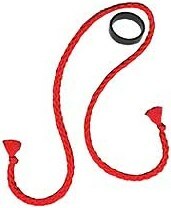 The 1.25" ring is precision machined and looks striking against the red rope. Effects include Ellis Ring standards like Ring Off Rope and Ring Off Wand, plus Chuck Leach's multi-phase routine Get Loopy. A black wedding band jumps from your finger to the rope, escapes from the rope twice and eventually reappears back on your finger!